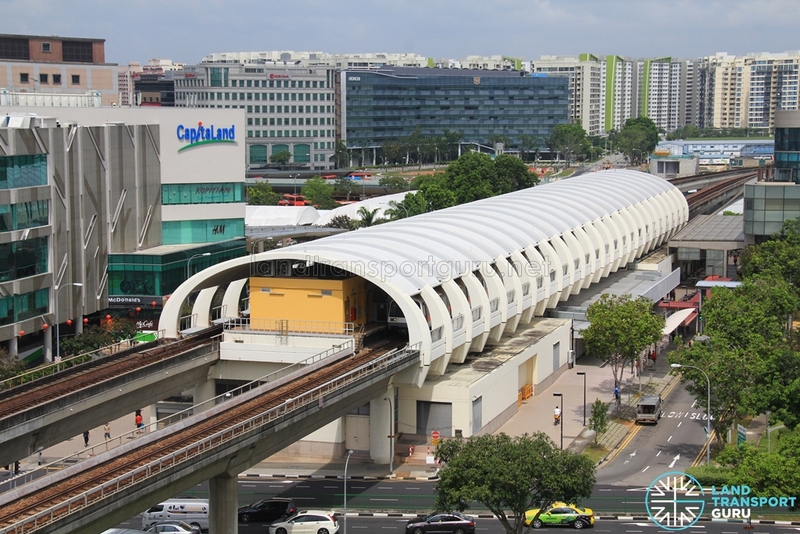 The East West Line (EWL) is a high capacity MRT line and the second MRT line in Singapore to enter service, connecting the eastern and western ends of the island via Central Singapore. It is currently operated by SMRT Trains. The EWL is currently the longest MRT line, at 56.6 km long with 35 stations, running from Pasir Ris (EW1) to Tuas Link (EW33). A separate branch line known as the Changi Airport Branch Line links Tanah Merah (EW4 | CG) to Changi Airport (CG2) via Expo (CG1/DT35). Running on elevated viaducts along most of its length, the line goes underground within the Central Area (between Kallang and Redhill) and near the Airport (between Expo to Changi Airport). Trains also go underground for a small sector below New Upper Changi Road between Bedok and Kembangan. Trains on the East West Line operate in a six-car formation, based out of Changi, Ulu Pandan and Tuas Depots, with the future East Coast Integrated Depot replacing the existing Changi Depot. The rolling stock is also used on North South Line, which joins the East West Line at Jurong East and Raffles Place / City Hall. Currently, alternate train services are operated between Pasir Ris – Joo Koon as well as Pasir Ris – Tuas Link, while the Changi Airport Branch Line operates as a shuttle train service between Tanah Merah and Changi Airport. 12 Dec 1987: City Hall to Outram Park stations opened, served by through-train North South Line trains from Yio Chu Kang. The bulk of the East West Line opened in stages between 1987 to 1990. City Hall to Outram Park first opened on 12 December 1987, with through trains from Yio Chu Kang (North South Line) crossing into current East West Line tunnels between City Hall and Raffles Place. The line extended west in 1988, first to Clementi and then to Lakeside, and in 1989, extended east to Tanah Merah and then to Pasir Ris. Both North South and East West Lines were split with the Tanah Merah extension, with trains no longer crossing lines between City Hall and Raffles Place. Finally, the line extended west to Boon Lay in 1990, completing the original system. In 2001, the Changi Airport Branch Line from Tanah Merah opened, first to Expo as a shuttle train service, and then to Changi Airport in 2002 with alternate trains from Boon Lay terminating at either Pasir Ris or Changi Airport. Owing to much stronger demand between Simei to Pasir Ris, through-trains to Changi Airport were discontinued from July 2003, and the Changi Airport Branch Line reverted to a shuttle train service. Also in 2001, Dover station opened, the first time a station was added to an operational MRT line. In 2009, the line extended west to Joo Koon. The Tuas West Extension added another four stations west of Joo Koon, extending the terminus to Tuas Link. Originally scheduled to open in end-2016, the opening was delayed to 2nd Quarter 2017 to allow for more time testing the upgraded signalling system. The Tuas West Extension was finally opened on 18 June 2017. The East West Line starts from the eastern end of Singapore at Pasir Ris, runs through the city centre and terminating within the Jurong Industrial Estate in the west, passing through the major residential towns such as Tampines, Bedok, Kallang, Redhill, Queenstown, Clementi, Jurong East and Boon Lay. Much of its route follows existing thoroughfares, notably between Tanah Merah – City Hall and Queenstown – Boon Lay. Running on elevated viaducts along most of its length, the line goes underground within the Central Area (between Kallang and Redhill) and near the Airport (between Expo to Changi Airport) to avoid building tracks at surface level. Another short tunnel between Kembangan and Bedok cuts through the Siglap Hill. Several overground stations are built in the centre median of roads, with either linkbridges or underpasses connecting the station with station exits on both sides of the road. The Tuas West Extension boasts the tallest overground stations and tracks in Singapore, where the line is built over road viaducts. Constructed alongside the North South Line (NSL) in the 1980s, both the EWL and NSL share similar technology and rolling stock. Both lines are connected by crossovers at Jurong East and in tunnels between Raffles Place and City Hall. Apart from pre-1989 through-train operations, peak hour NSL through-train services crossing over to eastbound EWL at Jurong East have since been discontinued. Engineering works are being carried out throughout the East West Line to improve service. Timber sleepers on overground sections of track are approaching the end of their lifespan, and being replaced by concrete sleepers, with work expected to be completed by early 2017. The third rail, which provides electricity to trains since 1987, is gradually being replaced. Finally, re-signalling works costing $195 million will upgrade the EWL to a Communications-Based Train Control (CBTC) system supplied by Thales, expected to reduce the minimum interval between trains from the current 120 seconds to 100 seconds. A section from Pioneer to Tuas Link station under the new signalling system was operational from 18 Jun 2017 till Nov 2017, when the Joo Koon train collision incident occurred. As a result, sections of the new signalling system (Gul Circle – Tuas Link) was isolated from the rest of the East West Line which was then running on the legacy signalling system. Full line train service only resumed under the East West Line full day new signalling system trials on Sundays between April and May 2018 and thereafter from 27 May 2018 as weekday trials of the new signalling system commence. As part of SMRT’s efforts to speed up improvement works, early closures along sections of the line and later train service start times on Sundays have been implemented. Noise barriers along certain stretches of elevated track near residential areas have also been constructed, expected to be completed by 2019. An additional scissors crossover will be built along the overrun tracks at Pasir Ris, along with Addition & Alteration works to extend the overrun viaduct by 148m from 270m by 2023 to facilitate faster turnarounds for shorter headways on the East West Line. Five batches of rolling stock operate on the EWL, namely the Kawasaki Heavy Industries C151, Siemens C651, Kawasaki-Nippon Sharyo C751B, Kawasaki-Sifang C151A, Kawasaki-Sifang C151B and Kawasaki-Sifang C151C from oldest to newest, which are also operated on the North South Line. Trains are maintained at Ulu Pandan Depot, Changi Depot and Tuas Depot.